Here is another of "The best advice I ever got" series. You will read about the best advice Colin Powell ever got. As mentioned previously, some of us may not be lucky enough to have successful mentors who may share and guide us with their wisdom. Here, you can read about advice that changed the lives of some of the most successful people without the mentors that they had, or attending any life coaching courses or business coaching trainings which may cost a bomb. Here, you get it for FREE!! What Colin Powell heard from a conversation between reserve army captains and a young infantry officer. "How do I become a general? ", A young second lieutenant asked an old general. “Thank you, sir.. so this is how I can become a general?”, asked the young second lieutenant. "No, that’s how you become a first lieutenant and then you keep doing it over and over." I’ve always tried to do my best today, think about tomorrow, and maybe dream a bit about the future. But doing your best in the present has to be the rule. You won’t become a general unless you become a good first lieutenant. 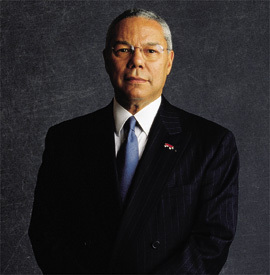 Colin Powell, the first African-American to be appointed, was a United States Secretary of State serving under President George W. Bush. The position is the head of the United States Department of State concerned with foreign affairs. It is the highest-ranking cabinet secretary both in line of succession and order of precedence. The stuff in the blogs blows out my mind.